Those who know me will not be surprised to hear that I started this project on the 27th, ie the date upon which it was due. My mother would be kind and say “well, you have a lot on at the moment”, which is true but realistically I would have left it to the last minute even if I had not been otherwise occupied. Which is a shame really, because this is a fantastic, easy recipe and I could have had a lot of fun with it. I still plan to, but I won’t get to post about it as part of my November challenge! Simona provided several short crust or pasta frolla recipes. Being lazy, I used the first one and used the food processor. It was so, so easy, I was quite surprised. The resulting pastry was somewhat hard to deal with, as it was very soft even after being refridgerated, but it may be easier if left overnight (there’s that forward planning thing again). Empty food processor’s bowl onto your work surface. Take out of the fridge the reserved pasta frolla you had cut away earlier. Roll it with your pin and cut into strips or use cookie cutter to make shall shapes or roll with your hands into ropes. Spread the jam or fruit preserves evenly over the bottom of the crostata. 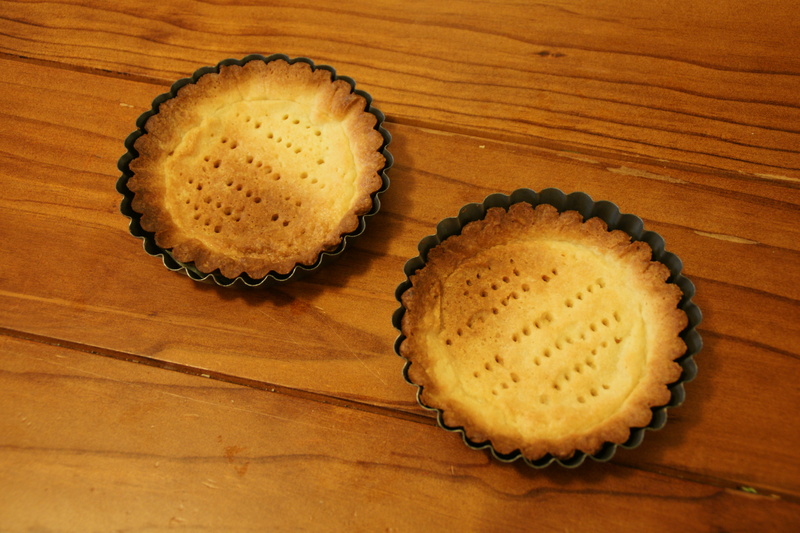 After 25 minutes, check the tart and continue baking until the tart is a nice golden colour. 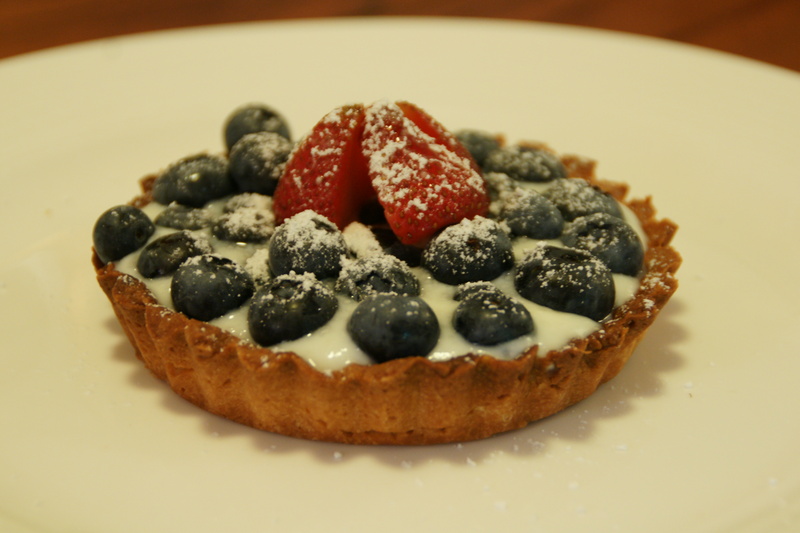 I decided to make a tart filled simply with lightly sweetened ricotta and fresh blueberries, partly because I was too lazy to make pastry cream, but also because I wanted something light and relatively healthy, and blueberries are delicious at the moment. 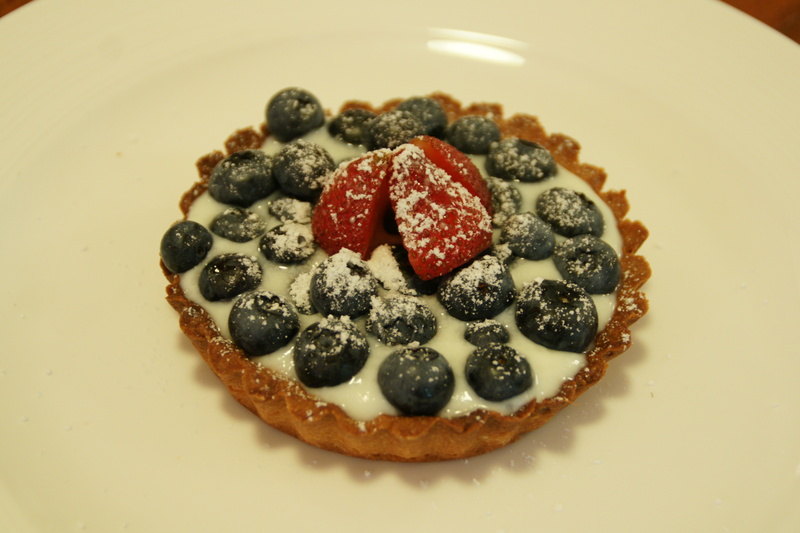 I only made two small tarts, which means that I now have quite a lot of left over pastry dough to use more creatively. I’m thinking the ginger brulee tart from the Bourke Street Bakery’s cookbook, which means I get to use my blowtorch! Happy days! Happy November everyone, and thanks to Simona. Baking is tops. I just love your simple crostata they look so wonderful and you prebaked them also. Well done even if it was at the last moment, Cheers from Audax in Sydney Australia. Ahhh that’s great to know, thankyou!